With the changing times, everything changes and medium of instruction is not an exception. We see that, today, majority want to send their wards to such schools where the medium of instruction is in English. Hence, the school management decided to begin sections where the medium of instruction is English, where L.K.G and U.K.G sections were initially commenced as the first step. In the coming years, this will be extended till the Tenth Standard. The Govt. 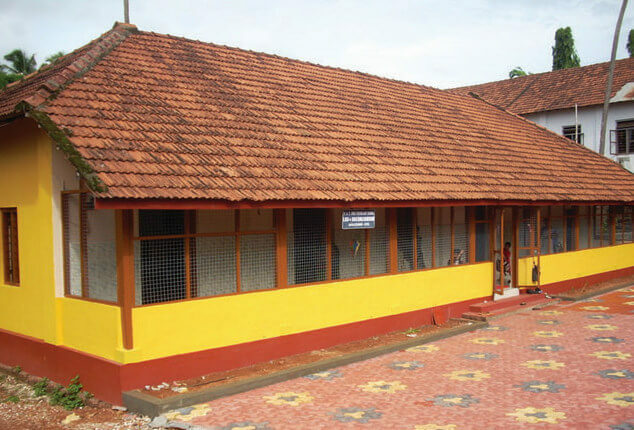 of Kerala had issued an order to all the Managements of the schools to renovate the old Buildings in accordance with the specifications mentioned in K.E.R and hence, many classrooms needs to be substituted. The Govt. provides Mid-day meals to the students for which a Dining Hall is necessary. 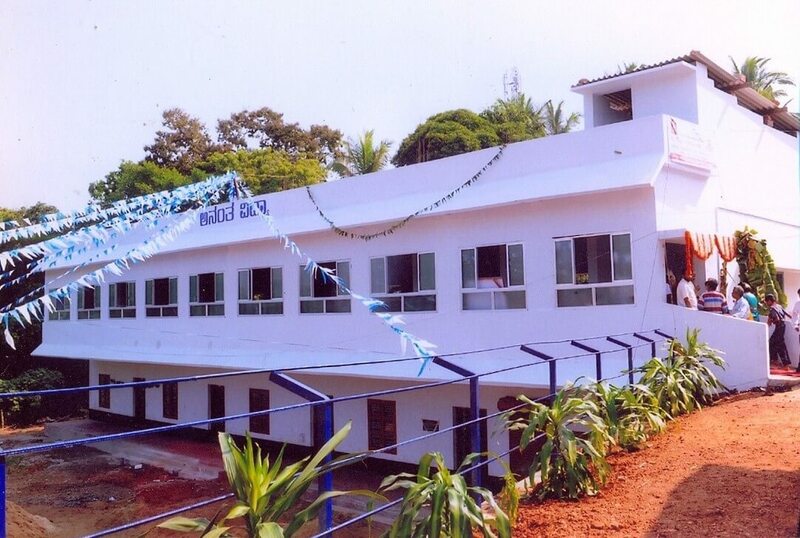 In the near future, the management decided to construct sufficient classrooms and a Dining Hall, which was done. 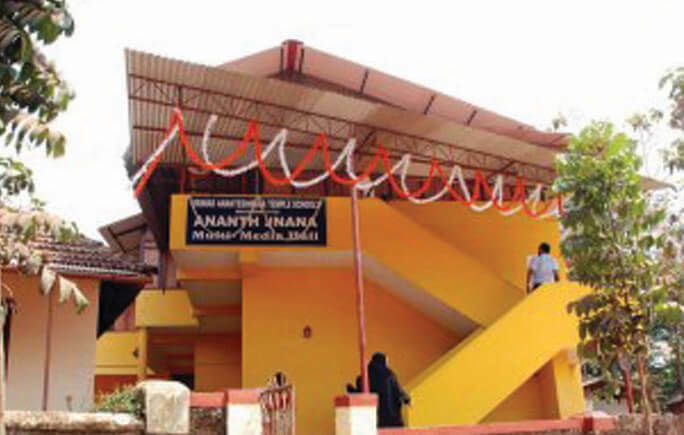 Shreemad Anantheshwar Temple High School, Manjeshwar has been endeared by its alumni at home and abroad, situated at Guddekeri in the heart of Manjeshwar town on the right side of railway track. It is at the distance of one kilometer from the pilgrimage centre Shreemad Anantheshwar Temple, Manjeshwar. Since it is located in a remote area, it is free from hustle and bustle of town. It has imparted knowledge to the students of far and near areas. Shree Manjeshwar Govinda Pai and other people with humanitarian outlook wanted to educate the youth of that period. By virtue of their hard work S.A.T Elementary School came into existence on 2-6-1925. Classes started in a building in front of Shree Dharma Agrahara at car street, Manjeshwar. When the number of pupils increased a marriage was built and the classes were held there. 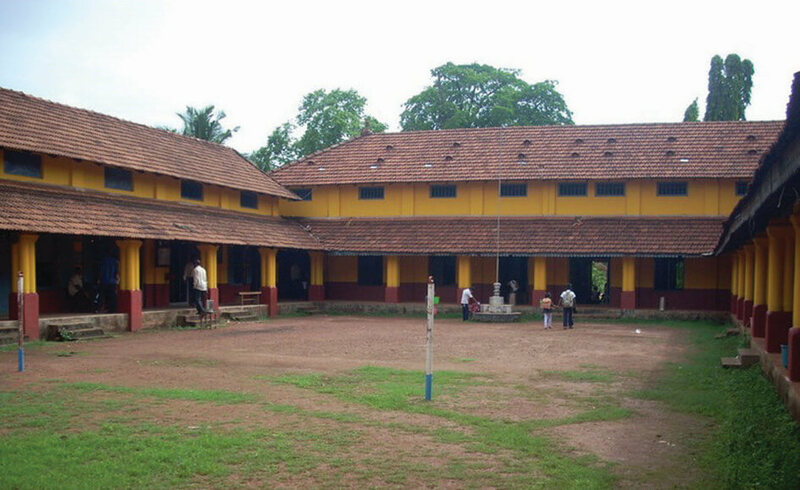 The main building was constructed in 1925 at Guddekeri, where at present elementary section is functioning. It is a roof building with high walls and ventilators. In spite of this building the students did not find place there and up to a period classes were held at near Bhaktha mutt and in a go down building on the right side as there were two divisions in classes. In the year 1935 permanent grant was sanctioned on 4-10-1936.Honourable M.A Ameeruddin laid foundation stone for the first extension of the building. On 7-2-1937 District Collector of South Canara A.D Crombie inaugurated the building. Manjeshwar was in the Madras province and it was the time of British Regime. The second extension of the building was over during 1946. During the year 1950 the elementary school was shifted to vana and only high school classes were conducted in the main building as it was upgraded as high school. It was owing to the strenuous effort of Shri K.P Kamath, who served as Executive Officer of the Temple. In the elementary school there were classes from first up to fifth standard. The old building was also extended when divisions were formed due to increase in students strength. It was then known as S.A.T Lower Primary School. Under same management two institutions functioned separately and some teachers served in upper primary section which was included in high school. Late Sri Purushotham Kini, who was teacher in upper primary section became headmaster in high school section until his retirement. In the year 1950-51 IIIrd form and following year fourth form and in the year 1953 first batch of S.S.L.C students appeared for the examination. In the year 1953 one more extension building was completed on the left side of the mail building with tile roof. On the near side of main building a stage was built with r.c.c roof. The foundation stone being laid by Swami Vijnanandaji of Ramakrishna ASHRAM, Mangalore. The same was inaugurated by Shri Ramakrishna Rao, who was then Governor of Kerala,on 28-11-1958. His Holiness Shri Shri Shri Sudheendra Theertha Swamiji of Kashimutt Samsthan,Varanasi,Kashi laid foundation stone for a RCC building in front of old building on 11-12-1957. The building was inaugurated by himself on 22-6-1961.It was a landmark in the history of high school. In the year 1963 the government condensed the S.S.L.C course to ten years from eleven years. In the meanwhile lower primary school was shifted to main building and upper primary section came under the headmaster of high school. In this institution for the overall development of students,various facilities were made. When the students from Bayar, Paivalike and Mangalpady used to come it was not possible for them to travel daily. So the management committee was kind enough to start a hostel with vegetarian mess. Considerable number of students (boys) accured the benefit from it. Shri Rama Kamath who was a teacher here was looking after the hostel. When the RCC building was constructed, hostel building was abolished. However the midday meals was provided to the poor students from the temple management committee free of cost. Mock parliament was held after school hour so as to inculcate administrative skill in the students. Other extra curricular activities were encouraged. In sports there were enthusiastic athletes and sportsmen who were trained by the Physical education teachers like Late Shri B.Srinivasa Rao, Smt Sumathi Bai,Late Hasanabba and Shri Girish Bhat. All these teachers inculcating discipline among the students. In the year 1960 Girl Guide movement was started by Smt.Sumathi Bai, the then Lady Instructress of our school. In the same year Auxiliary Cadets Crops (A.C.C) for girls was intoduced by Smt.Sumathi Bai, later on in 1969 it bagged the first A.C.C troop award in Kerala. The same was introduced for the boys by Late Shri Kadri Krishna Padakannaya. After this Smt Lilly Bai continued as a Scout and Guide teacher. In 1983 Kumari Sumana Baliga won the Presidential guide award. During the beginning of the school Shree Sharada Pooja Mahotsava was performed in the school by prathista of Sharada idol which was taken to jalastambhana on Vijayadashami day. In the Kalyana mantap some documentary films were screened using 16m.m projector. Students were enjoying it. Weaving classes were conducted by Late Sri K.Krishnan. 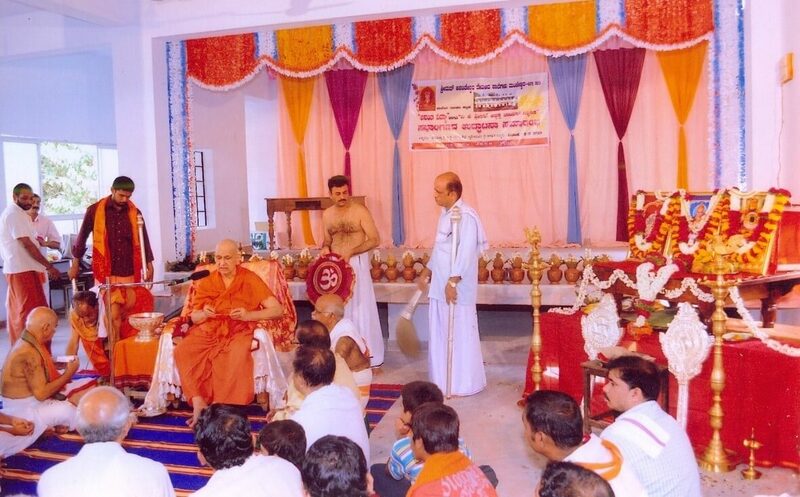 In “THINGALA HABBA”, Dr. Shivaram Karanth himself present and guided students. On 6-5-1985 the Diamond Jubilee memorial building foundation stone was laid by Sri.R.V.Deshpande,Minister for small-scale industries,Karnataka and the same was inaugurated on 6-5-1986 by Sri B.Ganapathi Pai, Bharath beedi works,Mangalore. It was followed with different programmes. Platinum Jubilee of the school was celebrated on 22-10-2000 with different cultural programmes. The students as well as the teachers and public witnessed a grand meal in the last day. It is obvious to say that our institution stepping towards 85th year by achieving academic and non academic excellence. With the blessings of god and faithful students and old students let it continue to spread fragrance to the world. 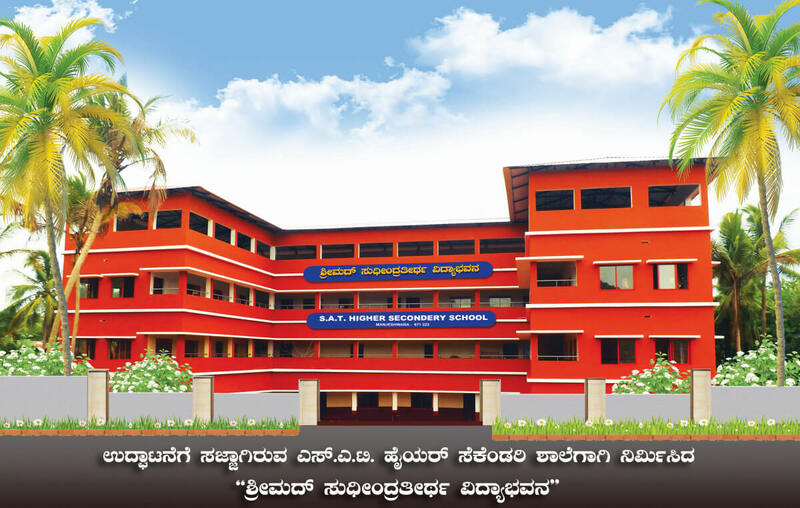 S.A.T school was founded by the Management of Srimad Anantheshwar Temple” with the sole purpose of imparting ‘education with values’ in non urban areas like Manjeshwar. The school was founded in 1925 when there were no facilities for education for an area around 20 Kilometers. Hence, students from far away places such as Kumbla, Kodlamogaru, Miyapadavu Moodambail and Ullal benefited from our Institution. Noon meal was also provided by the Temple Management for those students. Over the years, 1000’s of students have studied in this institution and at present are very well off, in better positions all over India and abroad.